Thats the challenge theme for this week at Whimsy. This last week has been absolutely crazy busy, it has flown by so fast. I have been busy trying to get prepared for my daughters graduation. I was also gone for a few days, so now trying to play catch up on everything. I did get this card done and posted. I was a bit later posting it than I would like, but none the less it's on my blog. 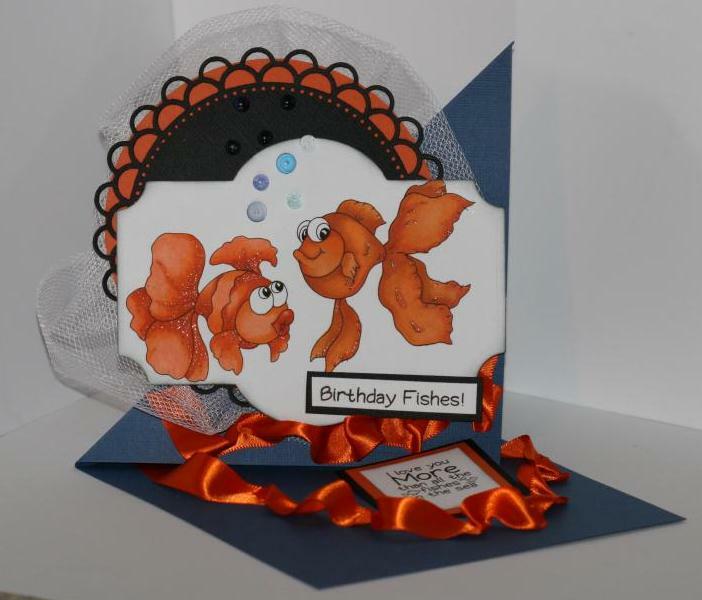 I love these images, they are from Whimsy Stamps by designer Crissy Armstrong. 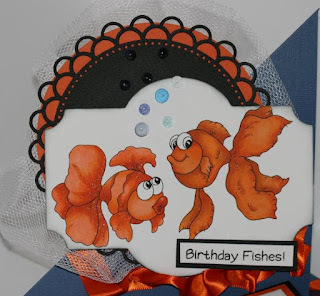 The fish on the left side of the card is Gertie and the fish on the right is Gunther fish. Aren't they cute, I added a bit of sparkle to them with my copic Atyou Spica pens. I used my Double Scallop Doily Die that I got from Whimsy Stamps again, I just love it. 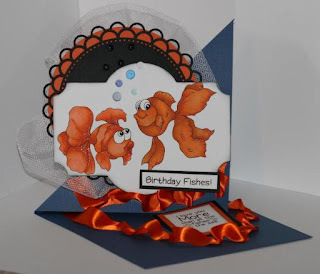 You should check out the other DT's fabulous cards on the Whimsy insiration blog, just click here and it will take you over the the blog. Here is my anything but square card. A closer look at the super cute images. Supplies: Whimsy stamps, Gunther and gertie, Double scallop Doily Die from Whimsy, Copic markers, Bazzill cardstock, Spellbinder, Robins nest bubbles, Ribbon. Thank you for stopping by to look at my blog. Hope you will pop by again soon. Those fishes are super cute, love the colors you chosen, very sweet. Also the layout of the card, nicely done friend. Ribbon, nice touch! WTG! You rock! June 6 Challenge Things with Wings.